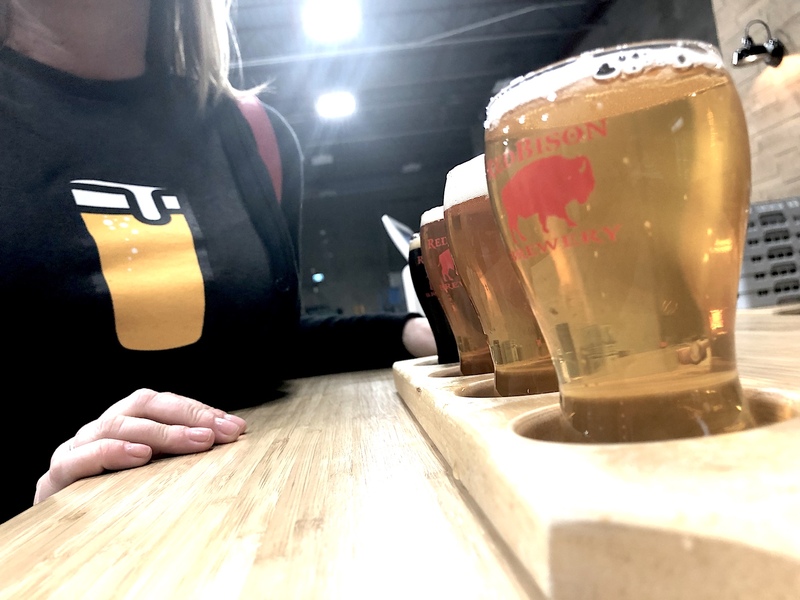 Red Bison Brewery is owned by beer lover, Steve Carlton. Although Steve’s background is in Civil Engineering, he loves to brew beer. After he and his wife, Veronica spent time as members of local brewery group, Cowtown Yeast Wranglers, Steve decided to turn their hobby into a business. With the help of friends, family and investors, they realized their vision. 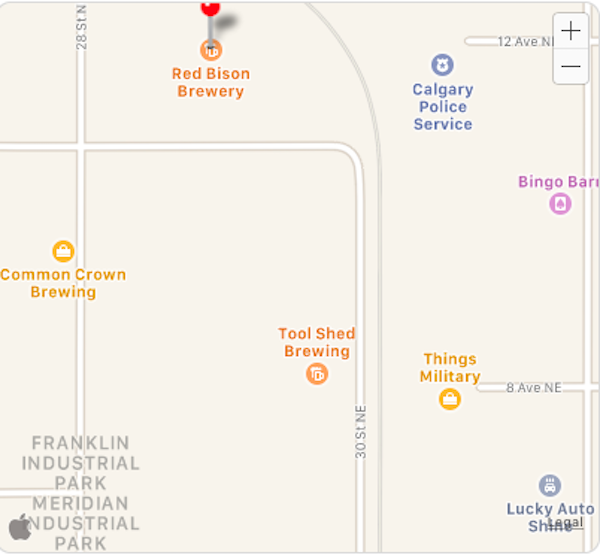 Red Bison Brewery now completes the Brewmuda Triangle with Common Crown Brewing Co and Tool Shed Brewing Company nearby in the Franklin Industrial Park in northeast Calgary, Alberta. 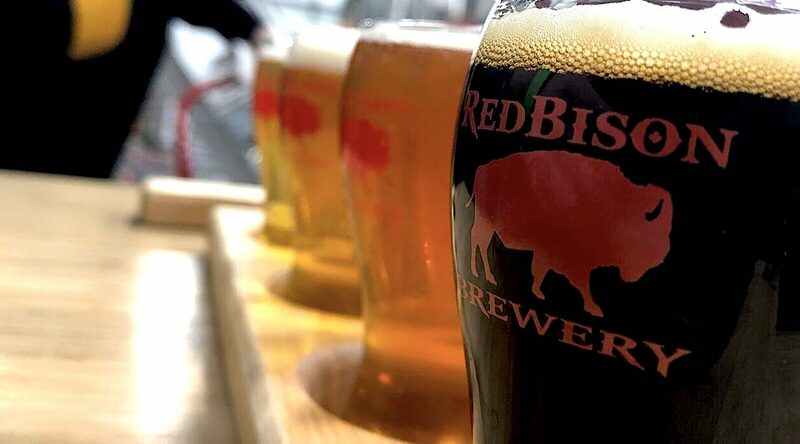 Naming a Brewery: How Did Red Bison Brewery Get Its Name? 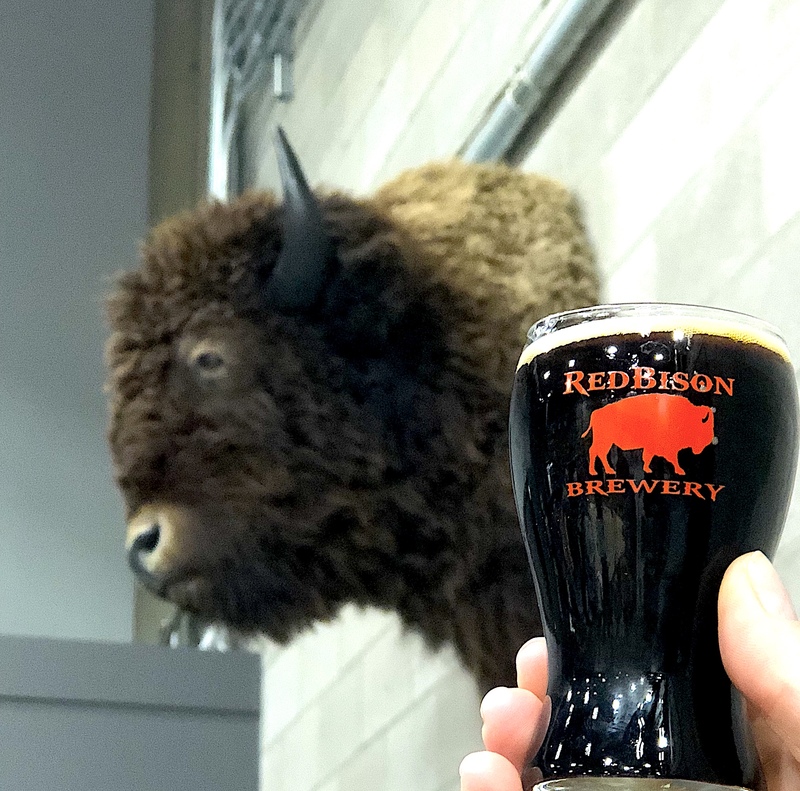 If anything says Alberta Craft, it’s the name Red Bison Brewery, but where does the name come actually from? 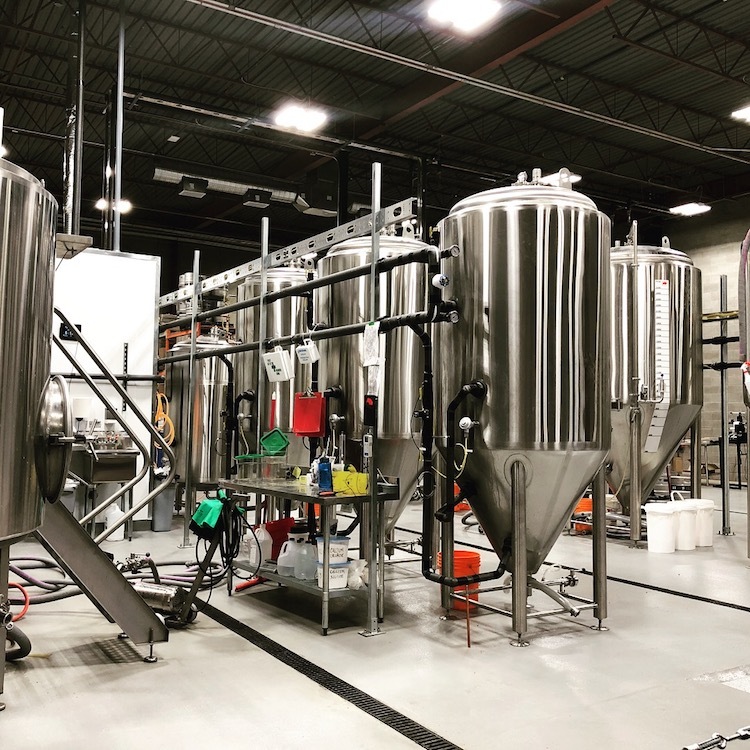 Originally their idea was to call the brewery “Red Rampant” after the red rampant lion on one of Scotland’s flags, as a nod to Steve’s Scottish heritage. Unfortunately, not too many people around Calgary really understand what a Rampant is, so from a marketing perspective it wasn’t the best name choice. Wanting to keep the spirit of Scotland as well as use a familiar Canadian animal, they chose Red Bison. Their motto is “stand out from the herd” and when you find your way into the brewery space, you’ll see they certainly do. From the outside of the building there’s nothing obvious that says you’ve arrived at the right place, except red lettering on a glass door. However, once in the building the second door opens to a bright, spacious brewery, taproom and kitchen all in one. Red chairs surround the well-spaced tables and of course, there’s a bison head on the wall. 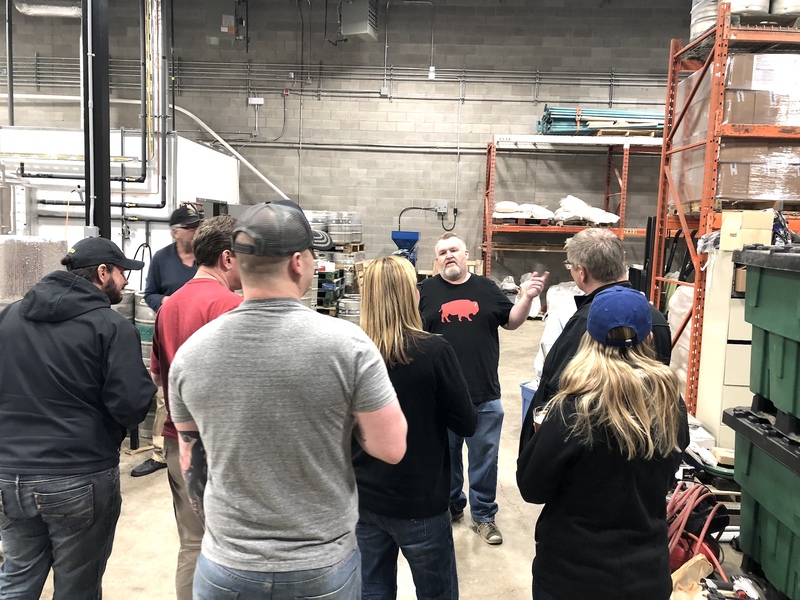 My colleague, Dustin Miller, was there with me for a tour in conjunction with Alberta Beer Festival’s Brew Ed with David Nuttall at the Brewer’s Apprentice. 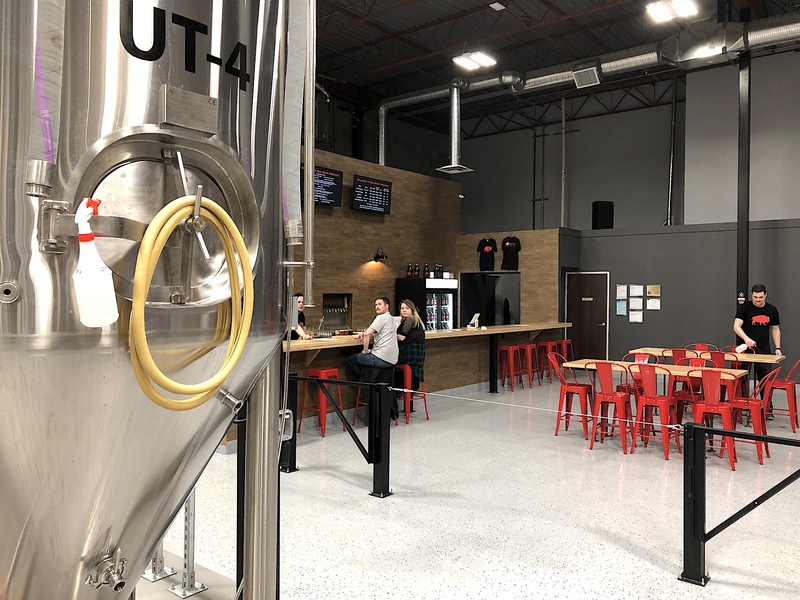 Each monthly course ends with a tour of a local brewery and since I’ve been meaning to get there since they first opened the doors a few weeks prior, I was excited when I heard the location of March Brew Ed brewery tour. They have four beers on tap, so Dustin and I decided to each purchase a tasting flight to see exactly what they have to offer thirsty visitors. Party Pants Pale Ale: 4.3% ABV. Golden colour. El Dorado hops. Slight bitter kick, resinous with floral and tropical notes. Batch 1 IPA: 7% ABV. Golden colour. Cascade, Chinook and Centennial hops. Super citrus all over the palate with lots of pine and floral notes. More intense aroma and flavour than the PPP. If that combo of hops sounds familiar, think Sierra Nevada Celebration Ale. Franklin Park IPA: 6.4% ABV. A bit darker than the previous two with a nice light amber colour. Cascade and Amarillo hops. Dustin’s description was perfect and I spit my beer out with laughter, “It’s pulling my face into my mouth.” Amarillo hops are pretty acidic and Cascade is tart, spicy and bitter. So yeah, it’s a rip your face off combo. Alta Mira Stout. 6% ABV. Creamy texture with a light coffee flavour and hints of vanilla and dark, bitter cocoa. Full-bodied and velvety. After a few sampling sips, we took our turn at a quick tour with Steve who told us a little history of the brewery and explained what all the equipment was for. They starting building on August 1, 2017 and only about a month ago they opened to the public. They’ve brewed about 13 batches now and estimate their totally yearly production to be approximately 18-21 hectolitres. Steve has no desire to make lagers. They take longer to brew – about six to eight weeks; whereas ales only take about a two weeks. From a business perspective, the faster turnaround makes more sense. By sticking to ales, they’ll easily be able to meet that production prediction. If you’re looking to fill a growler of their brew, you can do so at the brewery or pop into the Pig & Duke for a pint. Under the city of Bruges there are more than just water pipes, electricity wires and cable distribution there is a pipe that pumps liquid gold, so make sure to bring a beer mug if that main ever bursts.